Flip it, Fold it, Figure it out! Museum of Life & Science « Jeff Kennedy Associates, Inc.
We worked closely with the Museum of Life & Science, Durham, to design a family-friendly exhibition that engages visitors in mathematical thinking and problem solving in familiar and appealing contexts—art, music, architecture and everyday life. 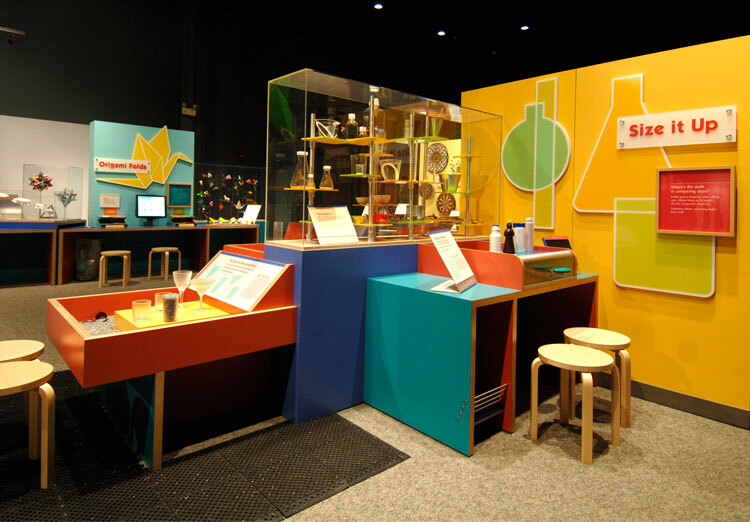 This NSF-funded exhibition traveled nationally and locally to grant participants of the North Carolina Grassroots Science Museums Collaborative. 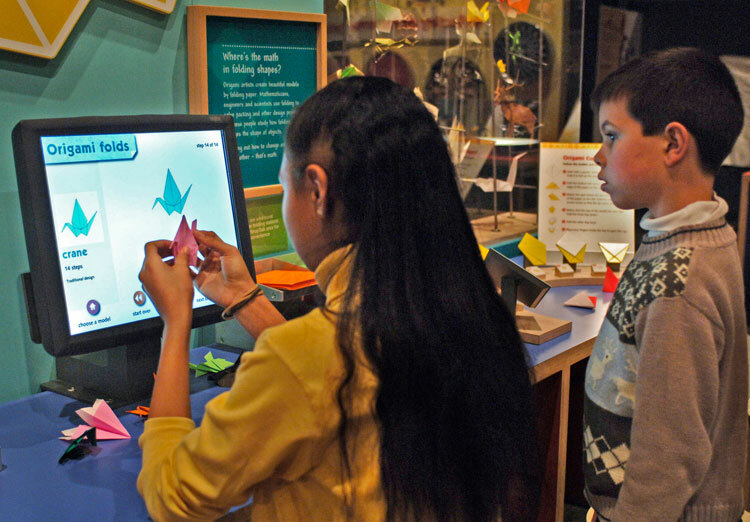 It is now permanently installed at the Museum of Life & Science. In the exhibition’s seven clusters, activities related to pattern, shape and size are surrounded by collections of real-world objects and images, from blueprints and telescope lenses to sneakers, quilts and rugs, illustrating how product designers, architects, craftsmen and scientists utilize and extend the same skills that visitors are using to create the objects and processes that abound in our lives. 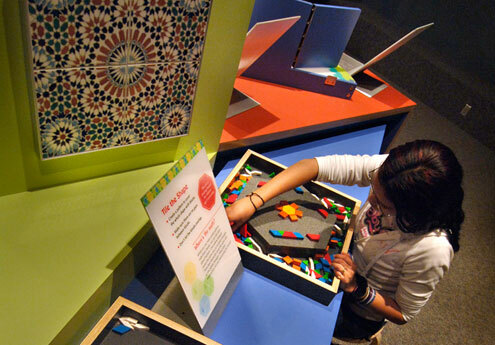 By setting hands-on activities in the context of human endeavors in the arts, crafts and trades, and using examples drawn from cultures around the world, the exhibition was able to achieve one of its primary goals: to make math concepts accessible to the broadest possible audiences, physically, culturally, and intellectually. 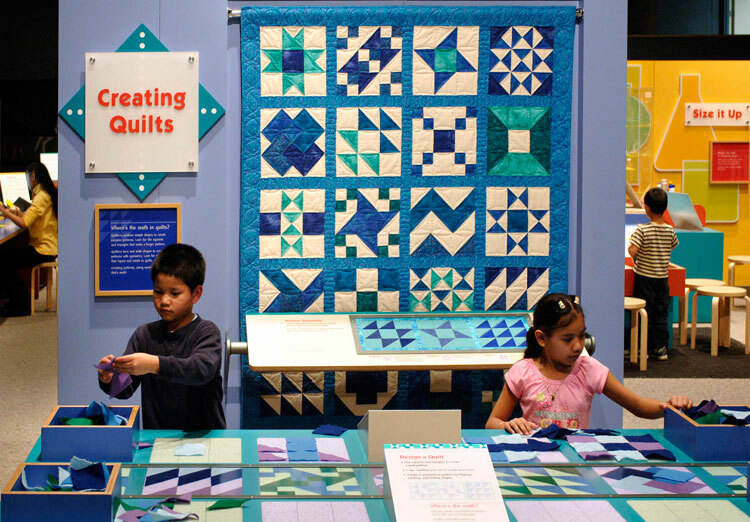 Challenged to cover different shaped surfaces without leaving any gaps, visitors create patterns with different tiles—triangles, squares, rhombi, hexagons. Using a touch screen, visitors move at their own pace through simple step-by-step instructions to create origami objects in a hands-on encounter with the beauty of geometry.